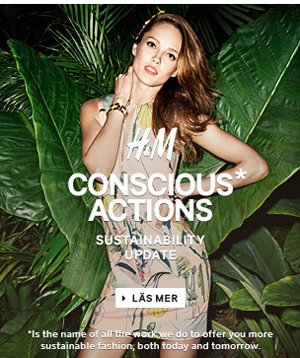 H&M recently announced an interesting new step in the progress of their H&M Conscious Foundation. In October 2013 the brand invited their customers to take part in their ethical fashion initiative. Through a global online voting process, they invited their consumers to choose which three global development issues the H&M Conscious Foundation should support. This resulted in the following through issues receiving the most votes: Education, Clean Water and Empowering Women. While we have always maintained a healthy skepticism in regards to the reality behind H&M’s ethical fashion initiatives, we are happy to see that empowering women is one of the three topics chosen by North American consumers. Through what we do at Shopanthropic, one of our key goals is to empower female artisans in the communities we operate in to develop better futures for themselves, their families and their communities. While the work we do is grass roots, it has become very evident to us that one of the keys to helping communities break free of social taboo and the poverty cycle is through empowering women. With a vote like this resulting in the public saying they want more work being done around the empowerment of women. That means that the work that the ethical fashion movement has begun to do around the world is clearly having positive effects on consumers. People are beginning to understand the need to help women create sustainable lives for themselves and that can only be a good thing for the grassroots work we are doing. That being said, as consumers in the fashion market and members of ethical fashion movement, we must keep pushing large companies such as H&M to follow through with the broad goals they set, ensure they are using money to achieve the most value for the causes they endorse, and ensure that the changes they are trying to make are sustainable and positive. So is this cool? Definitely. Will it work? We hope. The day is here – time to shower your loved one with chocolates, wine, food and gifts. We hope for this Valentine’s Day you purchased ethically made gifts and had a chance to spread the social enterprise message by sharing the #GlobalLove Campaign with your friends and loved ones. See you next year with more #GlobalLove for Valentine’s Day! The 2014 Sochi Olympics are controversial for many reasons from terrorist threats, to anti-gay actions, to the mass killing off stray dogs. While watching the impressive opening ceremonies last week, I was overwhelmed by the grandeur and saga-like performances by the Russians but I got to thinking about the ethics of international events such as the Winter games? What about the sourcing and production of the uniforms worn by athletes, volunteers, and performers? What about the treatment of the environment and workers involved in the production of such events and locations? We saw lots of fur during the ceremonies and lots of unique outfits. Personally, I found the sea of Red resulting from the HBC Canadian outfits and the luxurious look of Lacoste-designed French outfits to be the best of the ceremony outfits. While they showed country pride, what did they say about our countries? During the 2008 games, the Hudson Bay Company came into public shame when it was revealed that the Canadian uniforms were actually produced in China. The United States faced a similar outcry. For this year’s games, Ralph Lauren, the producers of the American uniform revealed that every article of clothing made for the American was created by America craftspeople and manufacturers. 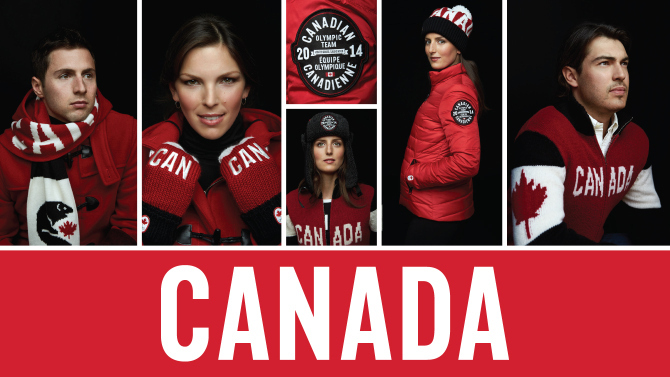 Similarly, Dimitri Soudas, executive director of the Canadian Olympic Committee, tweeted on October 30, 2013 that all HBC clothing worn by the country’s Olympians is made in Canada. While this statement was mostly true, the reality was that eighty-five per cent of the clothes made for athletes were made in Canada and the remainder in China. Is this good enough? We have to applaud the Americans for being entirely local and fair-trade in the production of their uniforms. Should we be impressed by the progress made by the Canadians? In an international event such as the Olympics, which celebrates athleticism, pride and nations of the world coming together for peaceful competition and progress, we should be considering issues such as the ethics behind the clothing and equipment used. We should support local, fair-trade and environmental standards. Wearing cruelty-based materials, using products produced in unsafe working conditions that result in unfair wages for producers and supporting the idea of fast fashion should not be the ideals of the Olympics. We need to continue encouraging our governments to consider the ethics of how we represent our nations and perhaps in the 2016 Olympics we will see more fashionable uniforms that make us proud not just for our nation, but for the ethics behind our actions. Valentine’s Day – Just a Few Days Away! As we get ready to wrap up our #Globallove campaign for 2014 – we wanted to remind you to think ethical on this special day. In a recent article on the ABC news online website, H&M’s head of sustainability talked about how there is “no conflict between its mission to sell more budget clothes and a drive to improve the environment and working conditions at its suppliers.” Ironic coming from one of the biggest buyers of garments from Bangladesh, a country now notorious for its less than ideal working conditions for garment workers. In fact, last year the company was second-to-last in a perceived sustainability ranking in its biggest market Germany. While the company has been making slow strides to embracing eco-conscious ideals through specified lines and products, they have really focused on the topic of working conditions and wages ever since the Rana plaza building collapse last year. The article talked about how the company is becoming “more critical of the use of cheap labor”. However, for a number of years workers in countries such as Bangladesh have been paying the price for the fast fashion that has become the cornerstone of H&Ms brand. Over the last year, H&M has been focused on lobbying the governments of countries such as Bangladesh and Cambodia to raise the minimum wage. In November of 2013, the retail giant “laid out a plan to pay a fair “living wage” to some 850,000 textile workers by 2018.” Furthermore, the company was the first to sign the pact to improve safety conditions at Bangladesh garment factories. With ambitious goals and a focus on creating a more sustainable image, it will be interesting to see what the company will actually accomplish as 80% of its merchandise comes from Asian suppliers. The company also employs 100 auditors to check on its 850 suppliers and has stated that sustainability will help them with long term profitability. With new eco-friendly lines on the way, a pledge to use only organic cotton by 2020, a goal to phase out toxic chemicals and a focus on producing more in new regions such as sub-Saharan Africa, time will tell whether the impact of the company is positive or negative? While their goals are admirable and could lead to amazing results, this could all potentially just be a publicity stunt. As consumers, we must hold this brand accountable for the public commitments they have made.